Get your location data on the map in a snap using addresses, standard geographic boundaries (such as postal code, city, or state), or latitude and longitude values. Our industry leading geoenablement services have high accuracy and let you display your locations as points or boundaries (when possible). Get serious with map visualizations. Use the best map visualizations possible to make your case and tell your story. Make your maps easier to read with map themes such as heatmaps or clustering. In areas where you have many points on the map, aggregating the points helps you understand patterns at a glance. View your locations by size, color, or both. Visualize sales data by size while using color to show which sales rep owns the account to quickly identify the rock stars. Control the data classification used to display your points. You know your data, and you know how it should be displayed. Use common statistical classification methods such as natural breaks, equal interval, quantile, or standard deviation to show your data appropriately. Use reference layers to spatially analyze relationships in your data and complement your tabular analysis. A reference layer can help you understand what’s going on in the areas that are important to you. The boundaries of these areas can be used to select your Power BI data and filter the other charts and graphs in your reports and dashboards. Use a demographic reference map such as population growth, median household income, or median disposable income to identify interesting areas. Use community-submitted ArcGIS reference maps to go beyond the basic standard geographies offered in demographic reference maps. A world of community-shared maps is at your fingertips. Whether you want to better understand sales patterns, or uncover potential business risks to your stakeholders, the ability is now yours by combining BI and spatial analytics for #PowerGIS. Want to try it out? Microsoft Power BI Desktop and enable ‘preview’ features by following these instructions http://arcg.is/2cXYNXS. 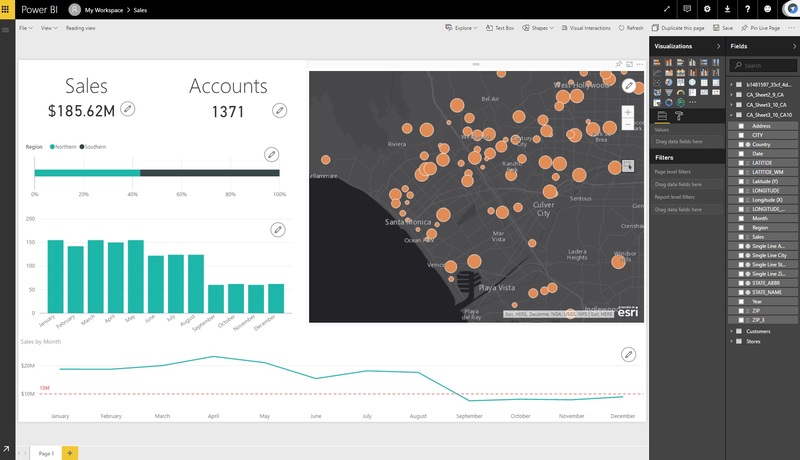 To learn more and sign up for our spatial analytics mailing list, head over to the ArcGIS Maps for Power BI page.